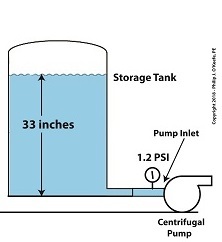 In our last article, we looked at an example problem involving a cavitating centrifugal pump that was drawing water from a storage tank. The bottom of the storage tank was sitting at the same level as the centrifugal pump’s inlet. 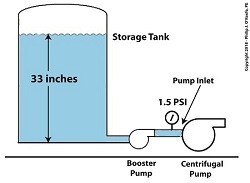 The water level in the tank could not be increased to raise the pump inlet pressure, and thus eliminate the cavitation. So, the problem was solved by elevating the tank with respect to the pump inlet. Okay, what if the tank could not be elevated? How do we stop the centrifugal pump from cavitating? Well, we can install a booster pump between the tank and the centrifugal pump. A booster pump is, as its name implies, a special kind of pump that is used to boost, or raise, water pressure flowing in a pipe. With regard to our example problem in the preceding article, the cavitating centrifugal pump inlet water is at 108ºF and a pressure of 1.2 pounds per square inch (PSI). Referring to the thermodynamic properties of water as found in tables appearing in engineering texts, we determine that if we keep water temperature at 108ºF but raise the pressure at the pump inlet from 1.2 PSI to 1.5 PSI we can stop the centrifugal pump from cavitating. We can install a booster pump to boost the pressure by the required 0.3 PSI and say goodbye to our cavitation problems. This wraps it up for our series on cavitation in pumps. Next time, we’ll begin learning about some different topics.